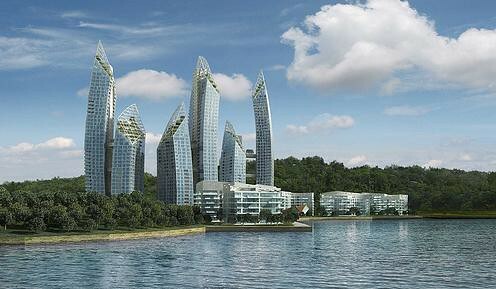 Daniel Libeskind’s first residential showcase in Asia has its platform in Singapore in Keppel Bay. His iconic design for Reflections at Keppel Bay will put Singapore on the world map for luxury waterfront homes. Reflections at Keppel Bay comprises a total of 1,129 luxurious waterfront condominium units housed in six glass towers of 24 storeys and 41 storeys as well as 11 blocks of 6- to 8-storey villa blocks. It offers choice units of 1- to 4-bedroom apartments and penthouses with sizes ranging from 700 sqft to a super penthouse of 13,300 sqft. The Libeskind development will sit on a land size of approximately 84,000 sqm with an extensive shoreline of 750 m.
The towers will all be topped with sky gardens on sloping roof lines. Sky bridges will connect each pair of towers, providing pockets of open spaces high above the ground and platforms for appreciating the panoramic views of the sea and the lush surroundings. This iconic development will feature a sculpture-like clubhouse with a full range of recreational facilities to meet the lifestyle of discerning homeowners. Every detail and aspect of design will optimise interaction with the sea and the commanding views of its scenic surrounds including Mount Faber, Keppel Club Golf Course, Labrador Park, Sentosa Island and its upcoming integrated resort, and the city skyline. Homeowners of this exclusive development will enjoy a 10-year complimentary membership to the 170-berth Marina at Keppel Bay when it is completed and opened in December 2007. Located on Keppel Island and linked to the mainland by a landmark cable-stayed bridge that will be completed in mid-2007, Marina at Keppel Bay will be able to accommodate yachts of between 100 and 200 ft long. Members will enjoy lifestyle facilities that include a clubhouse with a member’s lounge, gourmet restaurants, recreational amenities and leisure charter services to access neighbouring islands. Home-grown multi-national corporation, Keppel Corporation, through property arm, Keppel Land, continues to contribute to shaping Singapore’s skyline and fabric of city living in Singapore’s next phase of growth. Keppel Bay is set to put Singapore on the world’s prime real estate map as a true waterfront precinct comprising an iconic residential development designed by world renowned architect, Daniel Libeskind; the FIABCI-award winning condominium, Caribbean at Keppel Bay; a world-class marina, [email protected] Bay; and the new landmark cable-stayed bridge linking the mainland to the marina. Located just a five-minute drive away from the Central Business District, Keppel Bay is part of the vibrant waterfront city in southern Singapore comprising Sentosa and the upcoming Sentosa Integrated Resort, Harbourfront and VivoCity, Singapore’s largest entertainment and recreation hub. Keppel Bay enjoys the rare confluence of location strengths – of being near the city yet within one of Singapore’s best-loved nature and recreation enclaves. Combining the best in waterfront and urban lifestyles, Keppel Bay redefines premier waterfront living befitting Singapore’s position as a vibrant global city.